The American Veterinary Dental College (AVDC) has a nomenclature comittee that has defined classifications for dental fractures. This allows for better communication about these injuries. The AVDC has defined the uncomplicated crown fracture. This classification does not necessarily explain the ideal treatment for the tooth. Teeth having no fracture at all can be dead (non-vital), while teeth with either complicated or uncomplicated crown fractures, may be alive (vital). The uncomplicated crown fracture is a fracture where direct pulp exposure is not evident. 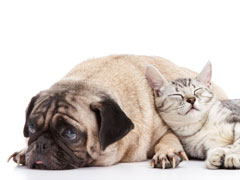 We recommend that pets having dental fractures are evaluated under anesthesia. This allows a better evaluation with dental probing and dental x-rays. This photo demonstrates a tooth that has no obvious pulp exposure. Anesthesia is necessary to confirm there is no pulp exposure. Dental x rays also help determine whether there are other concerns.